He will no be sticking around with your shower shite next season that's for sure. 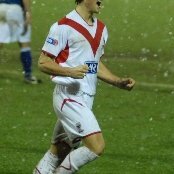 "2009–2010 season began terribly for the Montrose faithful, with the team failing to win any Division Three matches at all up to 16 January." "The club finished bottom of the Third Division for the first time in eleven years"
"At the end of the 2014–15 season, Montrose came last in League Two, but maintained their status in the SPFL after a 3–2 aggregate win in a play-off against Highland Football League champions Brora Rangers "
" 2017/18 season saw Montrose end 22 consecutive seasons in Scotland’s basement division. " Aye...The Glory Years......get a grip of yerself pal. The fact you even had to explain it. Unbelievable. But they are FIFTH in League One this season!!!!!!! All in the past.Fast forward to 2018 and we are League 2 Champions pretty incredible if you ask me. Yep.....super......22 years to win the bottom division........pretty incredible. If you are going to throw around inane, petty shite like " He will no be sticking around with your shower shite next season that's for sure." then don't get all high and mighty when you get told the truth about your lofty position, sonny. Not being petty at all we have been shite for years prior like you pointed out.Your looking to much into this shower shite comment it's a forum ffs am sure you have heard worse? I wouldn't have minded winning a league in the past 22 years to be fair. Me too! I don't understand why "Alessandro" has to be so unpleasant to other people online, it is most unbecoming. Anyway, we signed young Cameron Breadner on loan from St Mirren until the end of the season. He's a winger, a position we've needed to add depth to, so that's something. Aye..ok. We can be described as 'a shower of shite' but me pointing out the 'glory' of Montrose is 'unbecoming'. I notice you rarely pull up Neilly when he is 'unbecoming' toward chancers from rival clubs though. Just banter when he does it? I notice you rarely pull up Neilly when he is 'unbecoming' toward mouthy chancers from rival clubs though. Al. you seem to have anger issues, have you ever thought of taking up yoga? You'd probably look no worse than the Big Yin in a leotard and doing some breathing exercises would doubtless help you calm down. Frances and Neil have always struck me as affable types, you could do worse than learn from their positive, relaxed demeanor. I know both of them. Do you? Think Breadner is injured now! Out 4-6 weeks apparently. Lucky white heather. That's a pain in the arse, he looked really handy during his 30 minutes against Montrose. Is that THE ff on "off the ball" just now? ?